Make photocopies using your FREDCard. Funds will be deducted from your FREDFunds. If you do not have sufficient FREDFunds, you may add value to your card in the Student Accounts Office, or using the Valueport machine outside the Library, near the McEwen computer lab. Our book scanners allow patrons to scan documents to PDF or JPEG formats, to e-mail or save to a flash drive. One of our microform machines allows for free printing direct from the film. The others scan the film to a PDF, which you may email to yourself to print. Students can print this PDF using their print quota. Community members will need to purchase a print top-up card if they wish to print the item in the Library. How do I pick up my printouts? 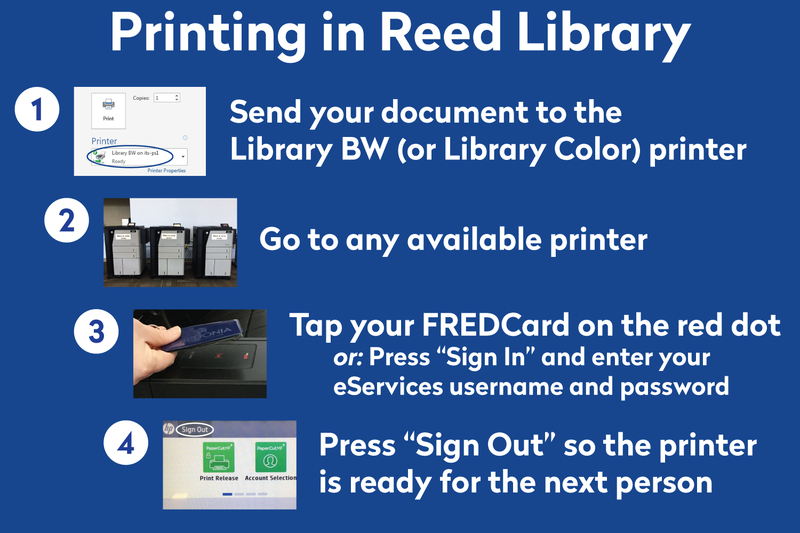 After sending a job to the Library printers, go to any available printer and tap your FREDCard on the red light near the front of the printer. If you do not have your FREDCard with you, you can use the touch screen to log in using your eServices username and password. Your prints will then be automatically released. Can I send more than one printout at once? Yes! You can send any number of jobs and release them at once. Printing jobs are held in the queue for up to eight hours. Each student begins the semester with a $20 balance in their print quota. Students can view their available balance from any campus computer, or online at print.fredonia.edu. Follow these instructions to print wirelessly. How much does each page cost? What if I run out of printing money? Purchase a $3.00 Print Quota Top-Up Card at the circulation desk using FREDFunds. The card will show the value, code, and web address. Access the web address and then enter the code to add the indicated amount to your account. If you do not have sufficient FREDFunds for the top-up card, you may add value to your card in the Student Accounts Office, or using the Valueport machine outside the Library, near the McEwen computer lab. How do I print double-sided from a Mac? Click on the Copy & Pages drop down menu → Select "Layout" → Select "Two Sided" → Select "Long Edge Binding" or "Short Edge Binding"